A bridge connecting with Christiania. After a number of years of admiring photos of Copenhagen and its cycling culture, it was time to check it out for myself. 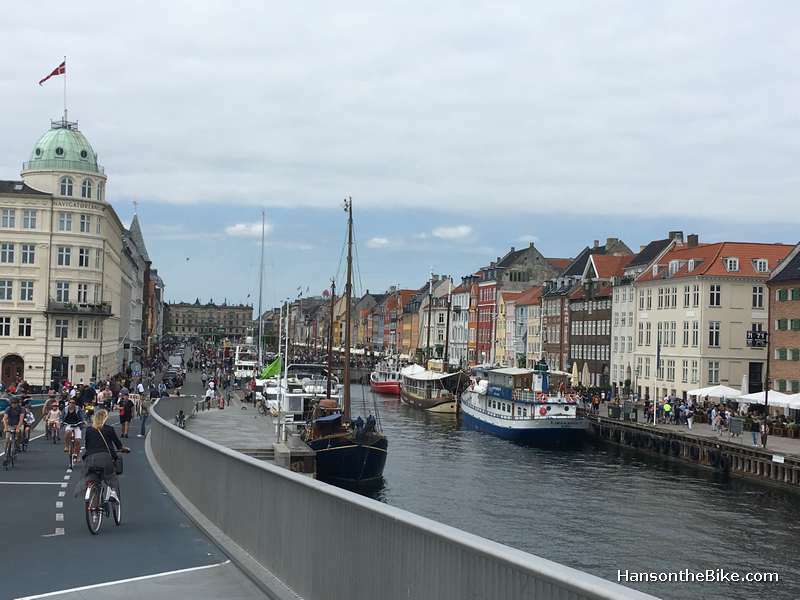 Last week, I reported on some of the sites we visited by bike in Copenhagen. This week, I am focusing on some of Copenhagen’s infrastructure. Just like you always see the same images of the windmills in the Netherlands, the tulip fields and the crummy bicycles parked in Amsterdam, Copenhagen has its icons too and the mermaid is one of them. Christiania should have a mention and dare I mention its Amagar Bakke waste facility that burns 70 tons of waste per hour? And there is cycling. It is a great accomplishment to put on the map a means of transportation as a thing to do. It took the Dutch much longer to wake up and understand the potential of cycling as promotion for the Netherlands. In a city with lots of water, you need lots of bike and ped bridges. Here are the ‘cirkel broen’ (‘circle bridges’ I am guessing) looking over a somewhat sterile part of Copenhagen. 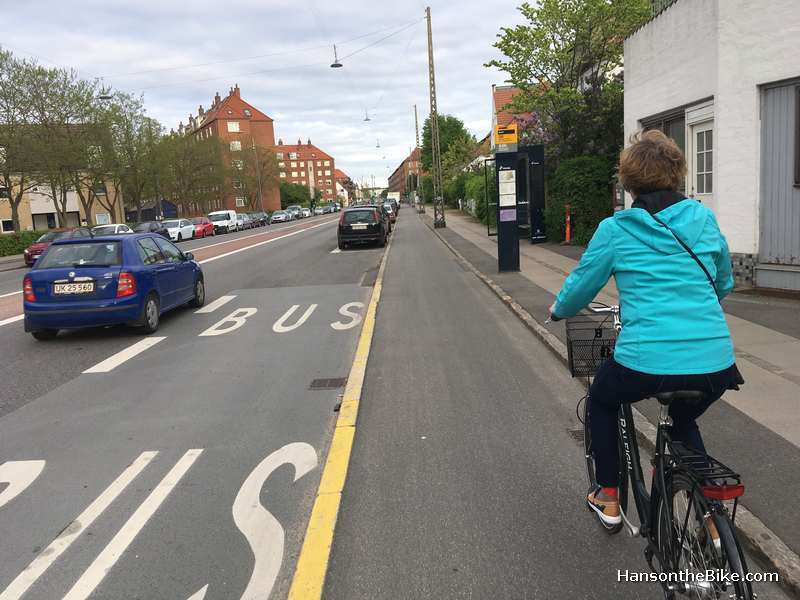 In Copenhagen it is very easy to take wonderful pictures of people cycling by as several people have been doing over the years, but I am usually more interested in what cities do for infrastructure, not only in the centre, but also in peripheral areas. The low racks show that Copenhagen is not much of a snowy city. A considerable snowfall would hide the racks and make it a trip hazard. 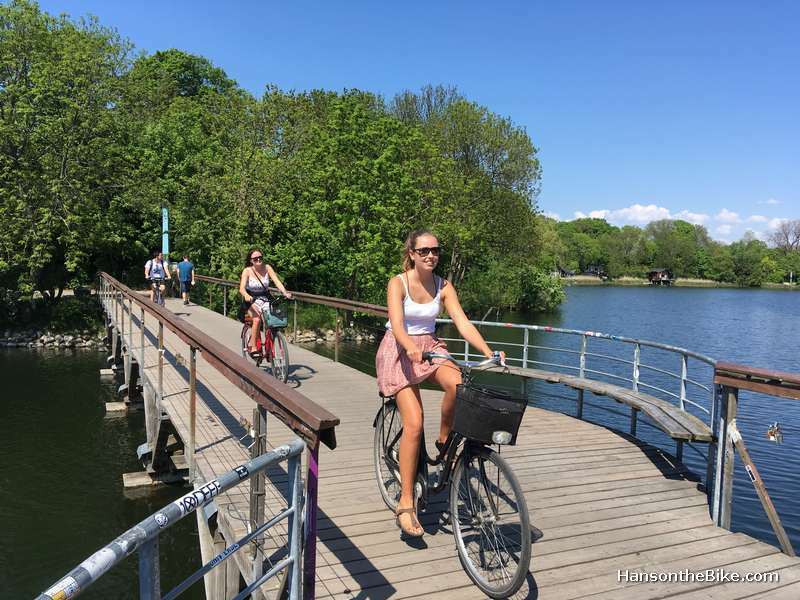 We enjoyed very much the bicycle network as Copenhagen has built it. 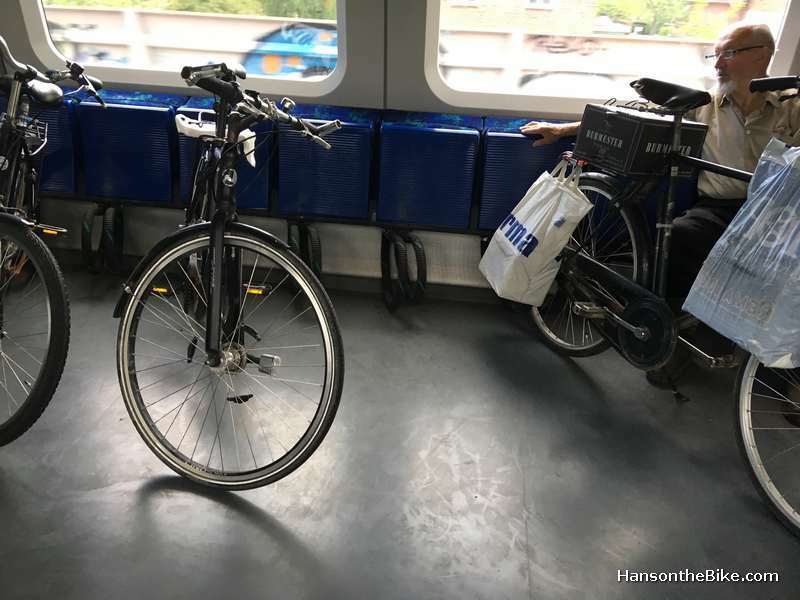 It is convenient, connected and allows cycling for many ages in the areas we biked around. We did notice though that the cycling population is fairly young. 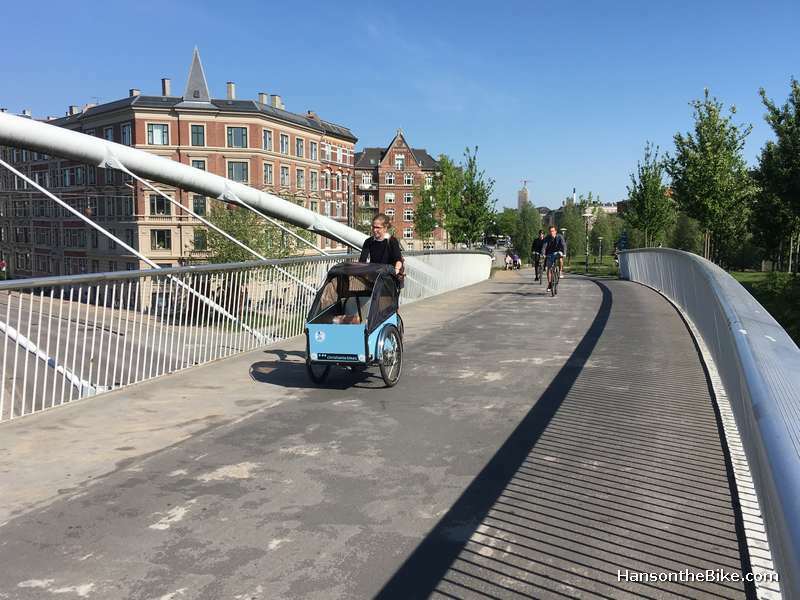 It appears there are much less seniors on bicycles than in Dutch cities and towns. 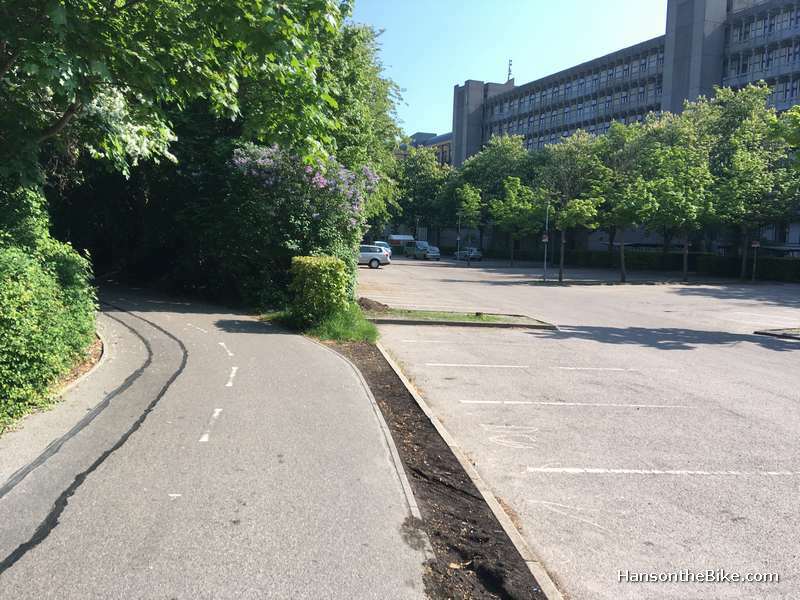 In this post I will share some images of every day Copenhagen bike infrastructure. I had always assumed it was similar to the Netherlands, but it turns out that is not really the case. Generally, I have found it a bit outdated and sloppier in places and less abundant from what I have seen. But that is OK, because it works just fine in most places. About 4 km from downtown. 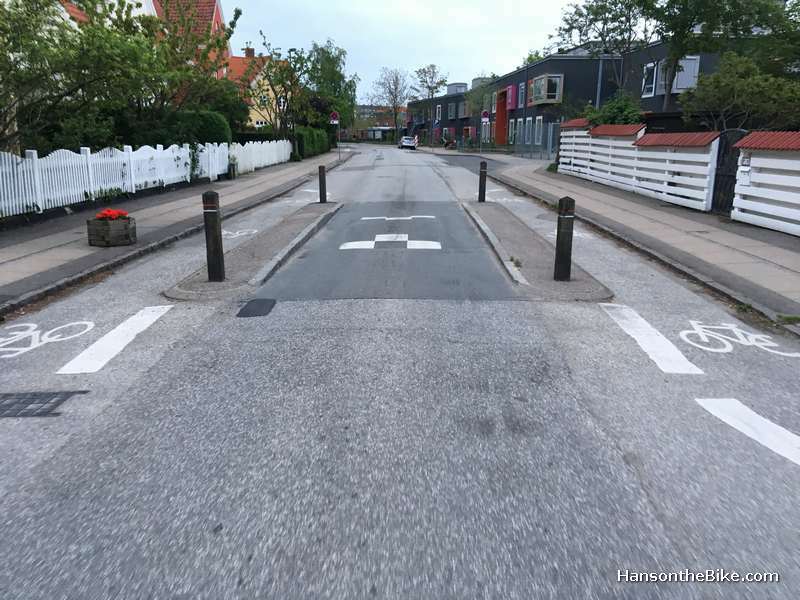 Raised bike lane into town along Valby Langgade. Note the bike lane is raised and the sidewalk is not only slightly separated with a paved strip but also raised again. People cycle between the bus and the bus stop. What counts when you start to build a bicycle network is that you can safely cycle within your community. Often, in North America we focus on commuters such as bike to work month, but I’d like to see an increased focus on neighbourhood cycling because this is where it all starts. If kids can cycle around safely they will hopefully turn into cycling commuters eventually. That means safe crossings, safe places to stop, safe intersections, safe green spaces where you can cycle after dark, bike parking, timing of traffic lights and so on. We cycled through the former Carlsberg Brewery property to see some brand new developments. (Search for “Ny Carlsberg Vej” on Google maps). Expect some similar designs at Zibi on the islands in the Ottawa river. Note the bio swales on the right. It is much harder to convince an adult who never cycled much to leave the car on the driveway and start cycling to work than supporting someone who always cycled and naturally progresses to a bike commute (cue: myself). Another reason for encouraging neighbourhood cycling is that you want to promote short distances to the library, the church, the hairdresser and -gasp- the dentist before you ask people to bike 12 km into work along an arterial road. Many trips are only a few kilometers so safe cycling in neighbourhoods is really where the low hanging fruit is. 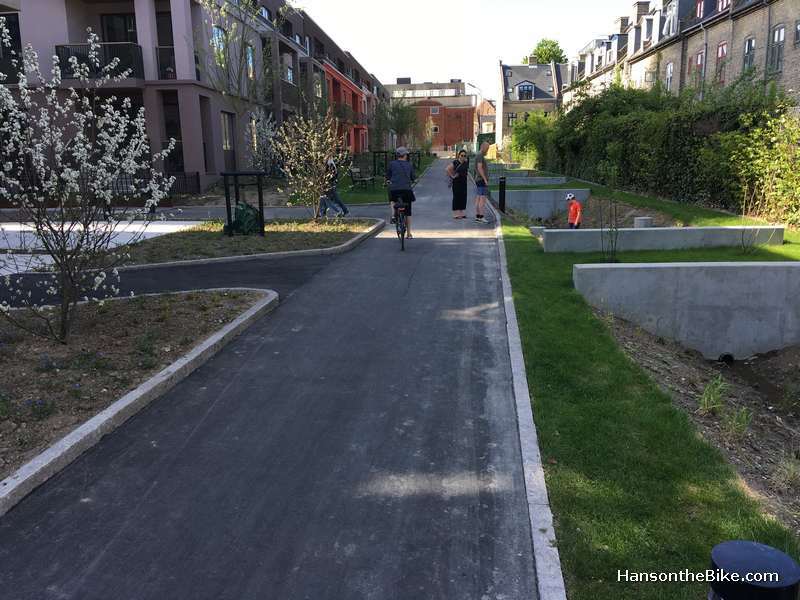 Let’s have a look at some of the areas which were a bit away from the beehive of downtown Copenhagen and see what they have done. This might inspire you to ask your city councillor for improvements. 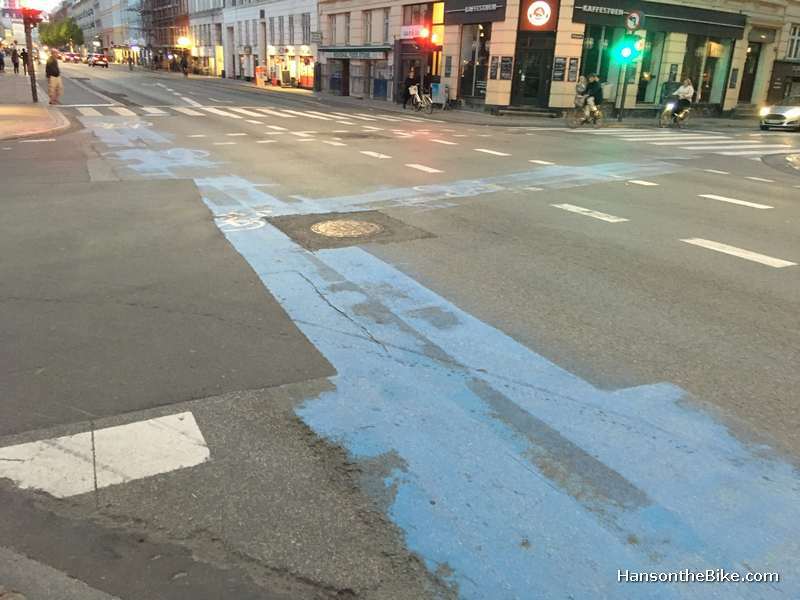 Copenhagen uses blue paint to guide cyclists across intersections. You will be sharing this lane with motorised traffic. I understand that drivers have to give the right of way to cyclists. The reality is that there is so much cycling that drivers don’t really have a choice anyway. What really surprised me is the lack of curb cuts. This gives me the impression that Copenhagen chose quantity of km over quality. A view from the new Inderhavnsbroen towards the place that every one has a photo of: Nyhavn. Note the entire area s mostly car free. Th bridge was received with mixed reviews as there is an odd dog leg in the bridge from what I remember. Further outside the centre, we were not sure if we were cycling on a bike lane or a service strip. A raised road narrowing set up allowing cyclists to continue but drivers to slow down. It is already quite suburban here, about 4 km from the centre, with very few cars parked on the road. It looks like there is some newer townhouse infill with some parking bays on the right. A separate bike path along the university property. Take a close look, Algonquin College. 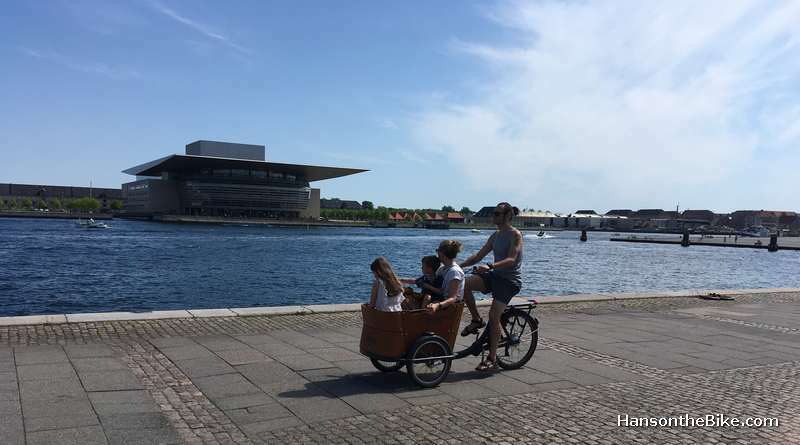 Cycling along the waterfront is very pleasant everywhere in Copenhagen. It is all car free and there are no fences. In the background the Opera House. I wasn’t exaggerating: it was really 26-27 degrees for 4 days. 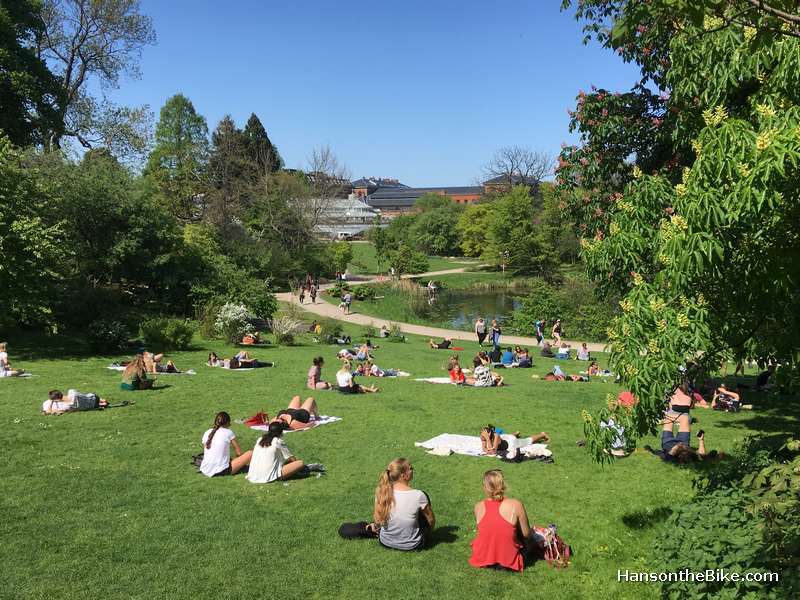 People flock to public parks (beer in hand), cemeteries and the biological garden in downtown Copenhagen. The mid rises often don’t even have a balcony so if you want to be outside, this is where you go. A bit further west from where we were staying is the Damhussoen lake (reservoir?) with paths along its shores. This reminded me a bit of Ottawa’s cycling infrastructure. 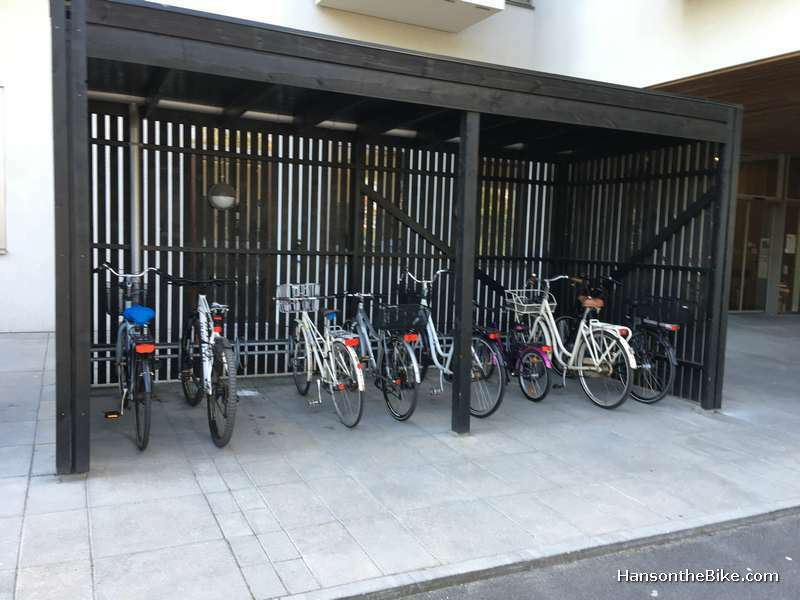 I liked this kind of bike parking. A light design and no heavy snow loads to worry about. (It is plus 2C/36F in the third week of January). I saw this mostly at condos and apartments. 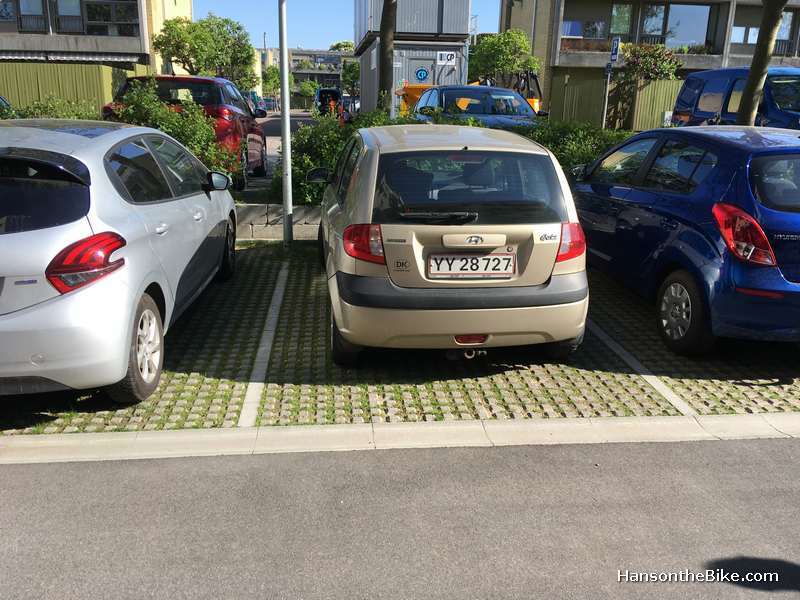 Permeable pavement for the block parking spots. Indeed you can’t park on your driveway in this set up. No water run off from large driveways here. My next driveway is going to look like this unless someone convinces me it is not a good idea. 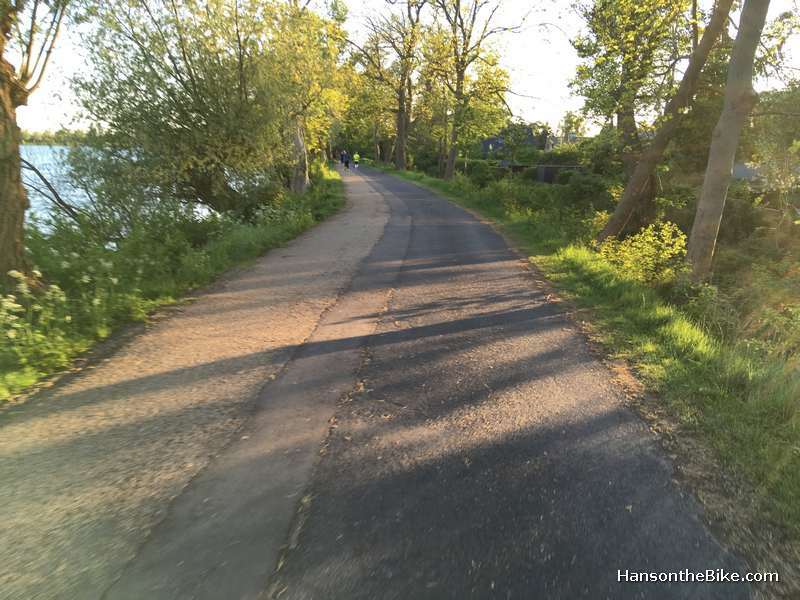 We fell in love with the bike path running southwest-ish to northeast-ish west from downtown. I believe it was the number 51. A lovely pathway meandering past cottages, crossing arterials and going to the business school and beyond. A really nice connector between different neighbourhoods. Note the care is taken to separate peds and cyclists with the cobblestone strip that functions as the gutter to the drain. This 5 meter wide ped and cycle bridge over a 6 lane highway is part of the 51 route. It is not uncommon to cycle across a cemetery. A bridge connecting Christiania with the rest of the world. The train system is not the easiest to figure out initially I found, but it is so frequent that it doesn’t matter if you miss one. Lots of space for bicycles. If there are no bikes, you can flip out a seat. So there you have it. 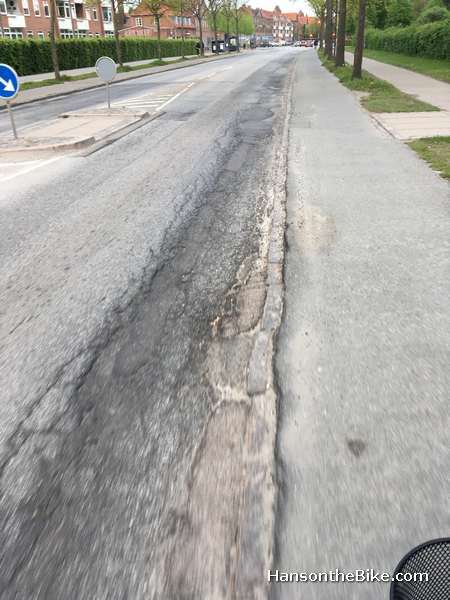 Flying all the way to Copenhagen to take pictures of asphalt. 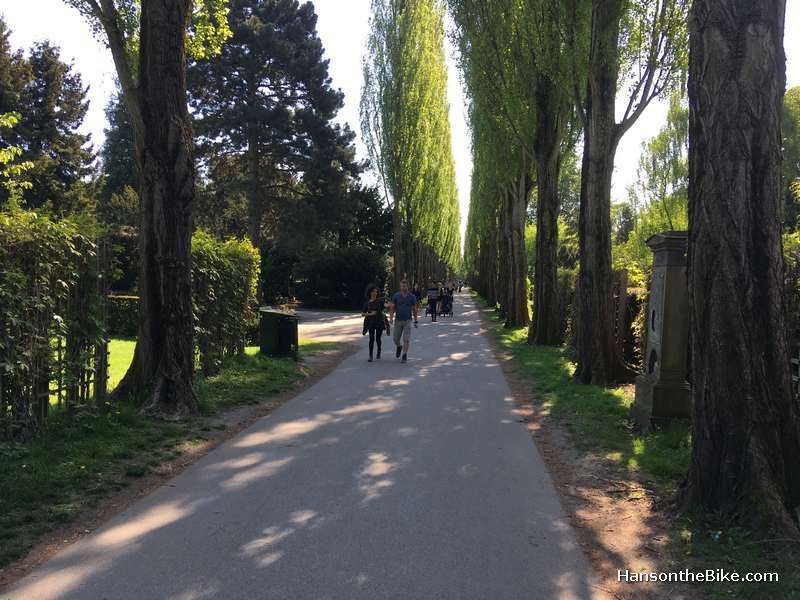 Last week I wrote about our great bike rides to some of the sites such as Christiania, the design museum, the tower of the Vor Freiskers Church and the Amalia garden. Read it all back here. 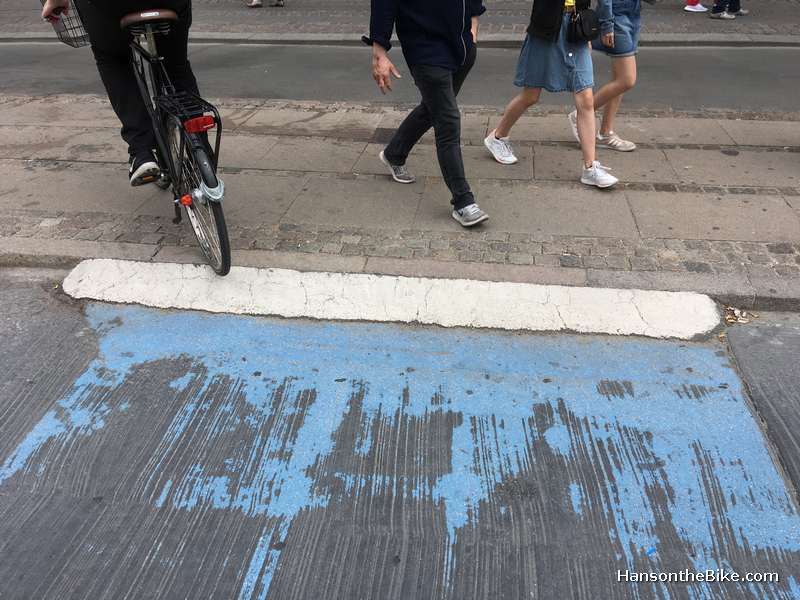 When i was in copenhagen last fall i looked for the much-heralded much-hyped cycling infrastructure. Should i be disappointed it wasnt significantly better than Ottawa? 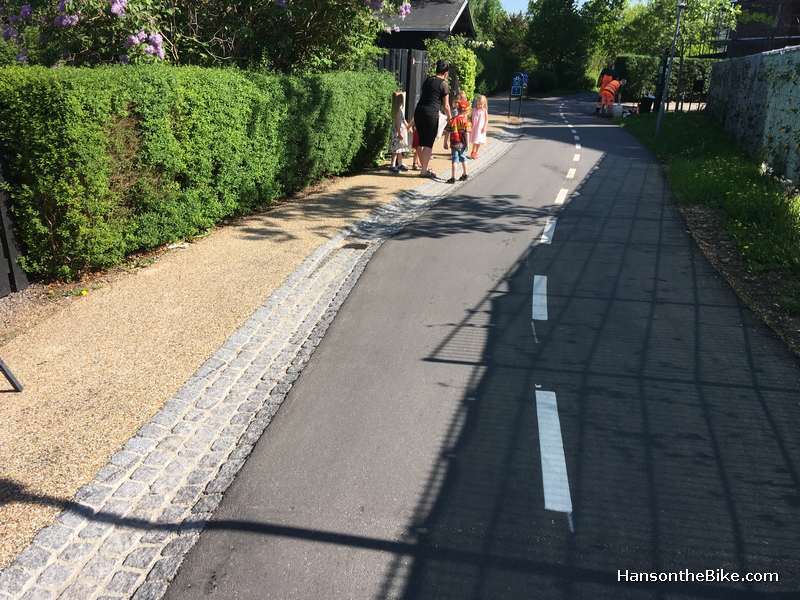 Or should i rejoice that our city’s cycling infra is comparable to the lauded / branded Cph ? I had the same thoughts. It wasn’t as superior as I had expected, but we shouldn’t forget that the whole Copenhagen cycle thing was also very much a marketing thing. And indeed, Ottawa’s cycling infrastructure, with the addition of a number of new bridges, is definitely getting much better. Although I’d like to see better cycling infra in areas near arterials such as Fisher, Merivale north of Baseline, Prince of Wales just to mention a few roads in my neck of the woods. Hi Eric, this is very interesting! 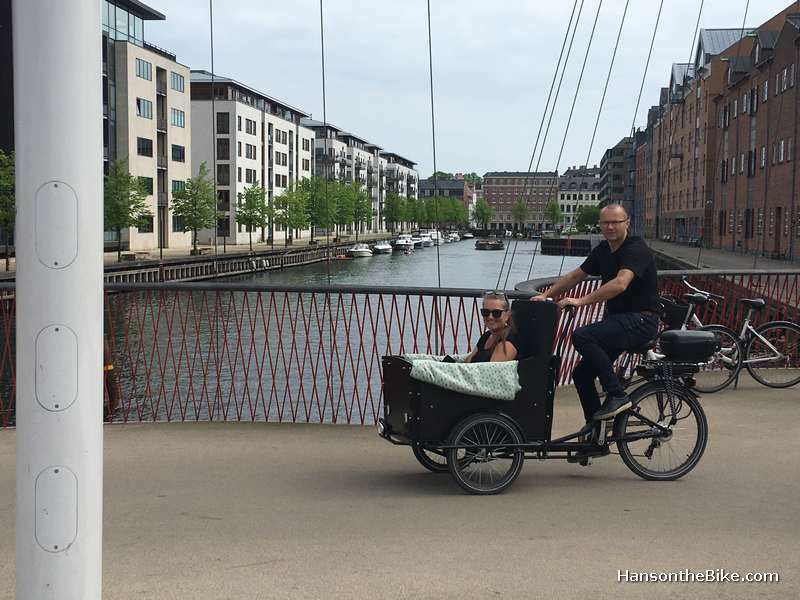 Are you saying that infrastructure-wise, Ottawa and Copenhagen are not that different? 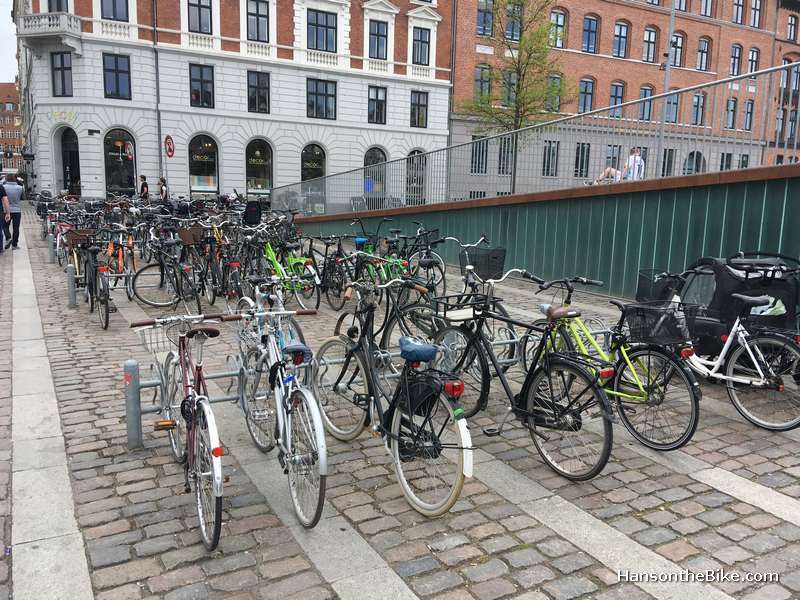 But, cycling is much more popular in Copenhagen, isn’t it? 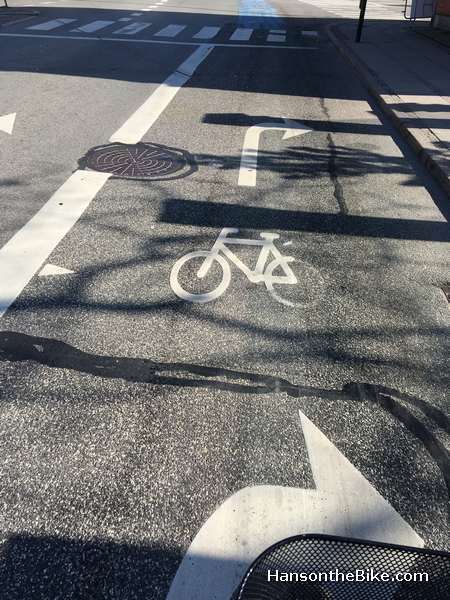 In this case, what would be the other elements that influence urban cycling? Those concrete block permeable pavers were all the rage in Ottawa back in the 1980s. There are ….err…were, multiple installs in my neighborhood.they did not work out well. In dry summer environments like ours the blocks continually wick up moisture, leaving the spaces between which were supposed to be green, dead. We have deep frost, which means they have to be laid on gravel substrate which is designed to drain, not support roots. Since then i have seen much thinner, finer pavement pads made out of recycled rubber tires, and plastic grids which dont wick out the moisture and have larger soil pockets to support plant growth. IMO, these pavers are a solution in search of a problem. Much simpler is my gravel driveway in which whispy grass grows, or my concrete paver patio with gaps between the blocks that permit 100% of the heaviest rainfall to run down through. Gravel is still an option too. No doubt my neighbours will think I am a hillbilly, but if I look on old satellite photos, it appears that previous owners of our house had a gravel driveway for the longest time.